A margin of victory of just 0.006 seconds is always an indicator of an incredible race finish. Mazda’s MX5 Cup racing class is a spec racer class with relatively low power, so you expect the finishes to be close, but damn that was an absolute blast to watch. It pays to keep in mind that this was the first race of the MX5 Cup season, and all of these racers were itching to get to the front. MX5 Cup is almost as exciting as the IndyCar action on track at COTA this weekend. 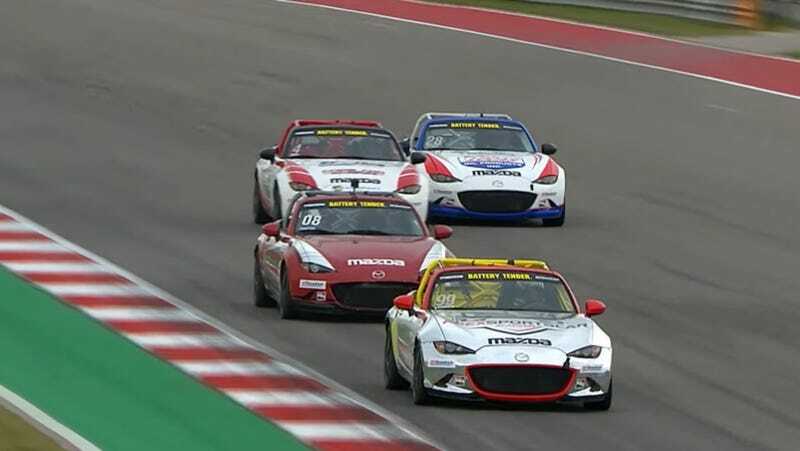 The folks running the show absolutely do not care about track limits at COTA, so these MX5s are being constantly flung over the curbs, and the race continues all the way out to the wall, the way it should be. Some drivers don’t take it quite so far, preferring to preserve their suspension, which makes some of these corners look like a sea of Mazdas. It doesn’t matter where you look on the track, there is more passing and drafting and beating and banging than an entire season of most road racing series. For these small cars COTA is a really big track with big long straights, and that just adds to the high-rev fury here. If any driver makes even a small mistake, they’re swallowed up by a swarm of buzzing roadsters. The top five battle is as intense as any battle I’ve ever seen on the race course. For the final handful of laps, there’s really no telling who will ultimately take the victory. This whole race is under an hour, so throw it on your big screen and get some mega racing action this morning to really wake you up. It’s incredible.